While the city’s industry and population were growing, social and political events, notably the Spanish Civil War and the long period of dictatorship that followed, set the tone for a time of upheaval. At the end of the 20th century, with the arrival of democracy, Barcelona rose again like a Phoenix, determined to become a great 21st century metropolis. The introduction of electricity at the beginning of the 20th century marked a new stage in the future of the industrial city. The Companyia Barcelonesa d’Electricitat was set up and by 1925 it was producing a third of all power generated in Spain and 70% of Catalonia's power. Increasing industrial activity and the continual need for more workers led to the growth of the working class, which showed its discontent with working conditions. At the end of July 1909 a general strike broke out that developed into a popular revolt known as Tragic Week. During several days of social confrontation, churches and convents were burnt and there were fires and looting all over Barcelona. The revolt was put down by the army and 2,500 people were arrested. But the social unrest continued and the consolidation of the labour movement led to important gains, notably the introduction of the 8-hour day. At the same time there was an outburst of Catalan national feeling. At the beginning of the 20th century, a number of politicians and intellectuals began to work together to revive the Catalan language and culture, giving rise to a movement known as Noucentisme. This new style spread to literature and the arts, and dressed the city in a new style of architecture that saw a return to the classical forms of its Mediterranean heritage, in contrast to the exuberance of Modernisme. TheNoucentistes started to reform and improve the education system. Volien fer de Barcelona la capital de la cultura catalana, i van crear a la ciutat institucions com l’Institut d’Estudis Catalans i la Biblioteca Nacional de Catalunya. On 6 April 1914 a political event took place that marked a turning point for Catalonia. The Mancomunitat was inaugurated at the Palau de la Generalitat under the presidency of Enric Prat de la Riba. This institution finally allowed thefour Catalan provinces to unite and signified recognition of Catalonia's territorial unity for the first time since 1714. The city grew in strength and itsindustrial growth continued with the introduction of new sectors, such as engineering and chemicals. Between 1920 and 1930 there was a big wave of migration, with people coming mainly from the south of the peninsula, which resulted in the construction of 13,000 buildings in the city. Barcelona was paved and electrified, it gained new infrastructures such as the sewer system and the metro as a new form of public transport. Catalan political hopes were dashed by General Primo de Rivera's coup, the imposition of a dictatorship in Spain and the dissolution of the Mancomunitat in 1925. The opposition continued to be active though, and on 14 April 1931, Francesc Macià went out onto the balcony of the Palau de la Generalitat in Plaça Sant Jaume and unilaterally proclaimed the Catalan Republic, a few hours before the proclamation of the Second Spanish Republic in Madrid. Three days later, following negotiations between the two new governments, the Generalitat of Catalonia was installed as an autonomous government. The outbreak of the Spanish Civil War in 1936 caused deep and painful wounds in the city, which supported the Republicans. For three days in March 1938, Barcelona was bombed by the Italian air force, Franco's ally. It was the first time in history that the civilian population of a city was bombed indiscriminately from the air. The cathedral and the surrounding streets were the hardest hit, along with Plaça Sant Felip Neri, where 42 people died, 20 of them children. Even today you can see the marks left by the shrapnel. The dictatorship installed by General Francisco Franco after the war subjected the Catalan people and their culture to strong repression. The Generalitat was abolished and President Companys was tried and shot at Montjuïc Castle in 1940. The Catalan language was forbidden in public, including the media, shows, social events, cultural events and even mass. The economic penury of the post-war period lasted well into the 1950s, when the economy revived and Barcelona gradually began to develop again. The arrival of SEAT in Zona Franca, the first big car plant built in Spain, and the growth of companies linked to this sector, produced a new wave of migration that continued for nearly two decades. New neighbourhoods were built to house the newcomers and Barcelona was surrounded by a large, densely populated metropolitan area. The 1960s and 70s saw the start of a protest movement demanding the restoration of democracy and the return of rights that had been lost, among them the right to use the Catalan language and the reinstating of Catalan culture. But this was only achieved after the death of General Franco, at the end of 1975, and the re-establishment of democracy the following year. The restoration of the Generalitat in 1977 saw Barcelona once again become the capital of an autonomous Catalonia, and start to recover its own identity, culture and language. In April 1979, following 40 years of dictatorship in which period local authorities were appointed from Madrid, the Casa Gran (City Hall) in Plaça Sant Jaume once again had a mayor who was democratically elected by the people of the city. Urban development took off again in the 1980s, boosted especially by the winning bid to host the 1992 Olympic Games. That produced a construction fever that not only left the city with some top-class sports facilities but also new neighbourhoods and large infrastructures, such as the road network round the city, a bigger airport, better urban transport and a new waterfront, with the reclamation of the city's beaches for public use. In 1992, Barcelona introduced itself to the entire world as an open, modern, Mediterranean city, while the successful organisation and running of the Olympics positioned it as a benchmark capital at the international level. The organisation of another big event at the start of the 21st century, the Universal Forum of Cultures in 2004, resulted in a further urban transformation. The coastal area bordering the River Besòs was reclaimed, the old industrial area in the Poblenou neighbourhood was revitalised, and the new 22@ and Diagonal Mar neighbourhoods were built. Since then, with its characteristic conquering and innovative spirit, Barcelona has continued to grow and change in line with the pace and style of the new times. It has adapted the use of technologies to city management and today is the number one smart city in Spain and the fourth in Europe, a big smart metropolis. 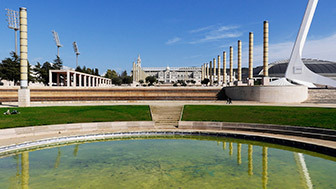 The International Exposition of 1929 meant the transformation of Montjuïc, the fair site, where the Palau Nacional became the main focus with the Magic Fountain at the forefront. The German national pavilion at the International Exposition held in Barcelona in 1929, designed by Mies Van der Rohe, is today an architectural icon of the Modern Movement. This replica of the Spanish Republic's pavilion at the Paris Universal Exposition in 1937 houses the Centre for International History Studies and a library that specialises in the Second Republic. Refugi 307 in Poble-sec is one of 1,300 air-raid shelters the people of Barcelona had to build during the Civil War. 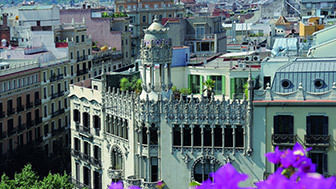 Today it is a Museu d’Història de Barcelona heritage site and the museum organises guided tours. One of the biggest air-raid shelters built in Barcelona during the Civil War was the Plaça del Diamant shelter in Vila de Gràcia. The Taller d’Història de Gràcia organises guided tours. The city was transformed to host the Summer Olympics. The Olympic Ring on Montjuïc was the epicentre of Barcelona 92, which was watched enthusiastically throughout the city's metropolitan area. 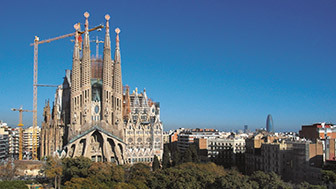 In 2004, Barcelona held the first Universal Forum of Cultures, an international event that explored cultural diversity and was held at a new site, the Fòrum. Barcelona's knowledge district is the most important urban development of recent years, and one of the most ambitious of its kind in Europe. The Quadrat d’Or in Eixample is the heart of Modernisme in Barcelona. The Olympic Ring keeps the spirit of the 1992 Barcelona Olympic Games alive.